First of all, I should like to congratulate the government of Chile with the decision to host this meeting, a decision that required vision, a lot of courage and important fi-nancial and human resources. A great many highly committed and devoted people in the Chilean administration have worked long hours for almost two years with the aim to make this the best meeting of the Conference of the Parties in the history of CITES. I have gotten to know them well and I am confident that in two weeks time we will all be able to conclude that they achieved their goal. I am sure to speak on behalf of all delegates from over 150 countries, the impressive number of partici-pants from non-governmental organizations from all over the globe and the world press gathered for the coming weeks in this great capital of your beautiful country, when I express our sincere gratitude to the Chilean government for hosting this meeting. I also thank the airport authorities and the city of Santiago for the meas-ures they have taken to facilitate things and to guarantee the security of delegates. This meeting is an important one for the future of CITES, for the conservation of the world’s wild animals and plants, for raising global awareness for wildlife issues in general and as a vehicle for raising public awareness for nature conservation in Chile and Latin America in particular. It enables non-governmental organizations and the media from Chile and from all over Latin America to attend the meeting and to follow it more closely than ever. The side effects of a meeting like this are very im-portant and although it is difficult to measure, the resources invested in hosting the meeting will undoubtedly come back to Chile and this continent, both during the meeting and for a long time thereafter. Ladies and Gentlemen: next March we will celebrate the 30th anniversary of the crea-tion of the Convention on International Trade in Endangered Species of Wild Fauna and Flora. In those thirty years, CITES has in my opinion developed into an agree-ment of fast growing importance and has become by far the most effective interna-tional legal instrument in the area of nature conservation. During this meeting, we will be able to officially welcome two more Parties bringing the total to 160. CITES is in many respects clearly doing better than ever before. Unfortunately, there is also reason for serious concern. There is a very worrying and rapidly growing gap between the increasing number of activities and results that Par-ties and others expect from CITES and its Secretariat and the means that are made available to fulfil these expectations. The decisions on budgetary matters are there-fore among the most important issues before this meeting. They will show how seri-ous we take the conservation of wild fauna and flora. They will show how serious we take this Convention and the role it will be able play in future for the conservation and management of wildlife in developing wildlife-producing countries. In the absence of the necessary core funding, CITES will not be able to fully exploit its great potential and we seriously risk to let down not only the many animal and plant species we appear to attach such great importance to, but we also risk to let down the developing world in its struggle to conserve wildlife from the many threats it faces. We spend a lot of time and effort in the Secretariat on obtaining additional voluntary contributions to the Trust Fund. We can do important extra projects as a result, but our activities should not become more dependent on such voluntary contributions. It is wrong to take important decisions and then to make their implementation depend on external funding. It is wrong to depend on voluntary contributions because it makes it almost impossible to prepare and plan important projects. It is most of all wrong because it creates false hope in developing countries. How many decisions of the past could not be implemented because the funding never followed? I therefore strongly urge the Parties to stop this negative development and to provide the fund-ing of decisions at the same time as taking them. The presence of so many representatives of non-governmental organizations and the media is a clear indication of the importance the citizens of the world attach to CITES. That world is watching. We cannot afford to disappoint it, we must not disap-point it. Among the important decisions before us are of course those related to the level of protection we give to species. Those that have been subject to the hottest debates in the history of CITES are undoubtedly elephants and whales. They again figure prominently on the agenda of this meeting and will once more attract most of the at-tention. I am confident that this meeting will reach wise conclusions and take the right decisions also where principles, opinions and convictions differ greatly. It is in-deed a good CITES tradition to discuss difficult issues with a high level of respect and understanding for other views, no matter how different these may be. I trust this tradition will be maintained at this meeting. As in any democratic process, there will be compromises and majority against minority decisions. Not everybody will there-fore get out of this meeting what he or she hopes for today. But if discussions have been open and fair, everybody should be able to accept the results of the process and in two weeks time look back on the meeting with satisfaction. I know that the wisdom, knowledge and experience of the chairpersons of the con-ference and its committees are a guarantee for discussions in which everybody and every viewpoint will get a fair chance. I wish the chairs every success and a lot of courage. The agenda is extraordinarily heavy and it will require tremendous skills to manage the proposed work programme. I count on all participants to help the chairs in this difficult task. My staff and I from our side will of course do everything possible to facilitate their job. In April 2000, at the 11th meeting of the Conference of the Parties, we unanimously adopted an ambitious Strategic Vision for the five years until 2005. We are half way through that period and many of the goals set out in the plan remain to be achieved. I therefore urge all Parties to give it due consideration in the second half of its appli-cability. Allow me to remind you just of the overall purpose of the Strategic Vision, which is “to ensure that no animal or plant becomes or remains subject to unsustain-able exploitation because of international trade”. With this simple motto in mind, we should be able to take appropriate decisions on all proposals before us. And propos-als there are certainly enough for everyone’s taste. There are no less than 60 proposals to amend the Appendices, that is to increase or decrease the level of protection afforded to species under the Convention. There is also a stunning number of something like 87 proposals for resolutions and decisions, discussion papers and reports to deal with at this meeting. I am sure everybody has found it quite a challenge to prepare for all of this in a year where there has been an avalanche of international environment-related meetings. First of all, I should like to repeat my concern that CITES has become too compli-cated to implement and enforce and stress that there is a great need to return to the basics, the things that really matter and that we need to focus on. There are too many resolutions and decisions to take into account and in many cases it is totally unclear why we have complicated things so much and what the conservation bene-fits of certain measures are today. The Secretariat has prepared a document for this meeting that starts the process of getting rid of unnecessary complications and red tape. I call on you to think carefully about the cost of the measures we have taken in the past, the cost of those we intend to take in the coming two weeks and the benefit these decisions have or may not have for wildlife conservation. I have been involved in CITES long enough to know that certain countries, NGO’s and even individuals are proud of what they consider their resolutions, because once upon a time they proposed them. I have a few of those in there from my previous life as well, but I of-fer to be the first to tear up these resolutions if we now find that they no longer sig-nificantly contribute to conservation. Implementation and enforcement problems exist in all Parties without exception. The many ongoing projects and surveys of the Secretariat and its partners and the re-ports to be presented to this meeting clearly demonstrate this. Much of the lack of compliance results from a lack of resources, but also from overcomplicated provi-sions and a lack of public understanding of the why and how of regulations. There is an enormous scope for making things simpler and cheaper and in doing so I believe we can dramatically facilitate your work and at the same time increase the effective-ness of the Convention, particularly in and for developing wildlife producer countries. My second observation concerns the resources that are required at the national level to cope with the increasing number of international meetings in a growing number of fora in the environment field. This clearly requires a higher level of coordination. I therefore have actively participated in the discussions of the past two years on the issue of International Environmental Governance that should have led to concrete results and decisions at the World Summit on Sustainable Development, but I am afraid it did not. I am glad we managed to raise important sums of money for our sponsored-delegates project. As a result, we have been able to assist the attendance of no less than 95 countries for this meeting and I am very grateful to all those who contributed. This kind of fund-raising, however, requires an enormous amount of time and effort and the reluctance of many donors to invest in sponsoring people to attend interna-tional meetings is obviously linked to the increasing number of such meetings. The Secretariat proposes to hold the next meeting of the Conference of the Parties in 2004 but then only every three years. This addresses the concern of many coun-tries about the number of meetings they have to prepare for and attend. It will also allow us to adopt three-year budgets instead of the current somewhat confusing sys-tem of alternating two and three year budget periods. It will further have a positive effect on the budget itself because there will be one meeting less every fifteen years. When talking about the availability of limited resources, one must mention the ap-parent lack of political priority given in many wildlife producing and wildlife consum-ing countries to CITES matters in general. CITES Management and Scientific Au-thorities are in many cases worse of than their colleagues in other government de-partments and lack the most basic resources. The lack of means to attend important meetings is but one symptom of this problem. 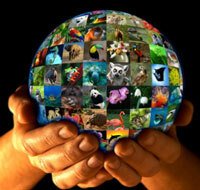 There is a major task for all of us, in-cluding non-governmental organizations and the media, to increase awareness among politicians and the general public that CITES has a visible and positive im-pact on wildlife conservation, on poverty reduction and on sustainable development and is therefore worth investing in. Yes, there is a price. If the global community wants wild animals and plants of the developing world to be shared resources and if it wants them to be a shared responsibility then the bill for their management and conservation needs to be shared as well. I should like to take this opportunity to express my deep admiration for the people who deal with wildlife management and conservation in the field and who risk their lives every day, again to a great extent as a result of being given an insufficient level of political priority and thus lacking the necessary resources and equipment. A spe-cial tribute from this meeting should go to all the men and women out there, the game wardens and officers of customs, police and specialized agencies in the CITES frontlines. They enforce what we decide and without them and their commit-ment, this Convention would not be what it is today: a Convention that makes a real difference for global wildlife conservation. We must take away the apparently widespread fear that a CITES listing implies the end of international trade or of commercial fisheries and forestry. There are recent examples that that is not the case. We must make it clear that CITES – in spite of its name - is not only about endangered species, but that it can be a guarantee for sus-tainably produced consumer products. We must have the listing criteria that allow us to list a wide variety of wild animals and plants in accordance with their conservation needs and that take account of biological differences between species. There are proposals before you to address all of these issues. Indeed a large number of documents in English, French and Spanish has been pre-pared for you. I absolutely must mention the enormous amount of work my col-leagues in the Secretariat have done for this meeting, in addition to the growing number of tasks they already have to carry out on a daily basis. I am extremely proud of the fantastic team we have in the Secretariat and grateful for their dedica-tion and resulting many hours of uncompensated overtime. Let me assure you that all of them, and of course I, together with our skilled interpreters, rapporteurs and many Chilean friends will do everything in our power and beyond it to facilitate a successful outcome of this meeting. In spite of the volume of meeting documents, CITES is perhaps the only Convention that still makes them available to participants in hard copy before and again at the beginning of its meetings. This makes CITES conferences the ones with the sturdiest and most wanted tote bags. I am grateful to the sponsors mentioned on them for providing us with this highly practical support. In particular through our website you have this time had access to information with unprecedented speed. The Secretariat’s recommendations on proposals, the com-ments from the Parties and from many international and non-governmental organiza-tions form a thorough but diverse basis for your participation in the meeting. I am sure you will make the right choices among the many different options that have been presented to you. CITES meetings are a unique opportunity to meet many hundreds of people involved in nature conservation around the world and to renew old and conclude new friend-ships with them. I am sure you look forward to that aspect of the meeting as well, particularly because as a result of the many important and sometimes controversial proposals before us, the coming two weeks will not be without stress. I therefore recommend to all of you to use the weekend in the middle of the meeting to catch your breath and enjoy the beauty of Chile. For your own good avoid the creation of working and drafting groups that will have to meet on that weekend. As a personal contribution to the reduction of the risk of weekend meetings, I will stop my interven-tion here. I wish all of you a successful and rewarding meeting.